Home › Mobile Phone Accessories › Armbands › GOOJODOQ Universal 6 ..
My J7 Pro with slim bumper case fits just right. I wore it to the gym and had no issues. 1. Compact &Lightweight, suitable for 6.0 inches or below phone screen. 3. Super soft ,Light ,and comfotable Gym Sports Waist Pouch Bag Phone Holder. 4. With earphone hole allows you to listen to music while running. 6. Storage Compartment:Can take small stuffs,such as phones,earphones ,credit cards ,Cashes ,keys. 7. The waist strap/belt is adjustable,Pockets no distinction between men and women. Functions: Touch Screen Friendly + Water Resistant + Sweat Proof + Earbuds Jack + Elastic Straps + Washable + Zipper. 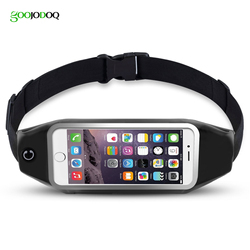 Material: Lightweight Neoprene Belt stays secure without bouncing and is so comfortable you'll forget you have it on. Size: Adjustable Elastic Belt fits both large and small waist (25.5" to 39.3"). Use: Best Choise for Running, Sports, Workout, Exercise, Gym, Jogging, Bicycle, Women, Men, Girls, Boys, Guys, Runner, Walker.